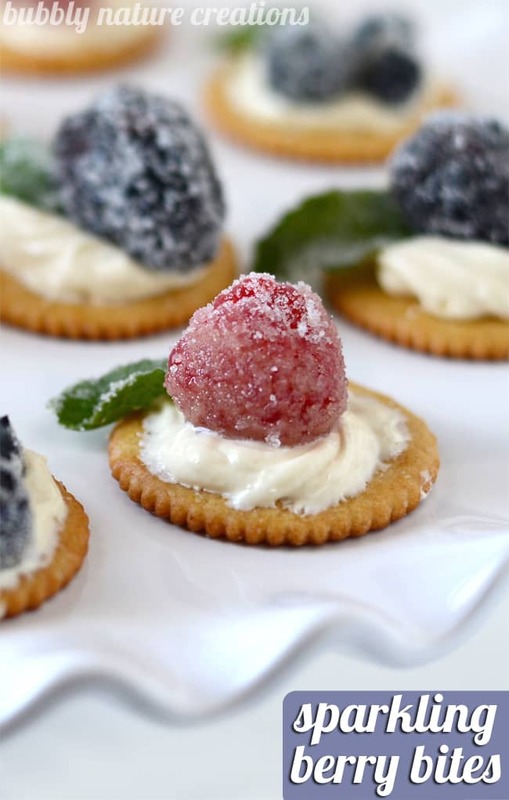 These Sparkling Berry Bites look like they took all day to make. I took these to a family Christmas party and everyone thought that they were so fancy. I think that the berries look like they have a dusting of snow… they are just so pretty! I like pretty desserts. I like them even more when I don’t have to spend all day on them! The base is just a simple butter cracker like Ritz and on top of that I put a layer of white chocolate cream cheese (Philadelphia brand). Then I added some sparkling berries and sparkling mint. To make the “sparkle” on the berries I just dabbed a thin layer of egg beaters onto each berry. Then I rolled each berry in sugar. (The kids really love to do this part too!!!) That is it! I laid them on some paper towels to dry before putting them on the crackers. For the mint leaves I just painted one side with the egg beaters and dipped the one side in the sugar. The sugar adds a beautiful touch. 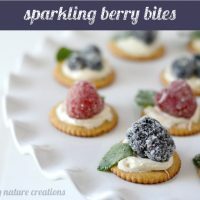 Such a pretty appetizer or dessert, these sparkling berry bites are delicious for any party. 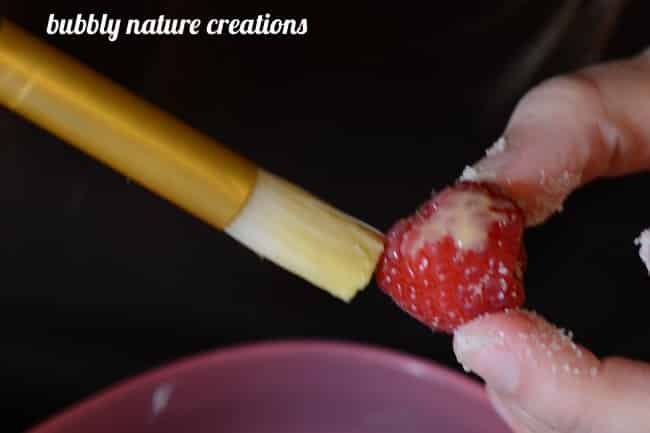 Start off by painting each berry with a thin layer of egg beaters and rolling each berry into the sugar. 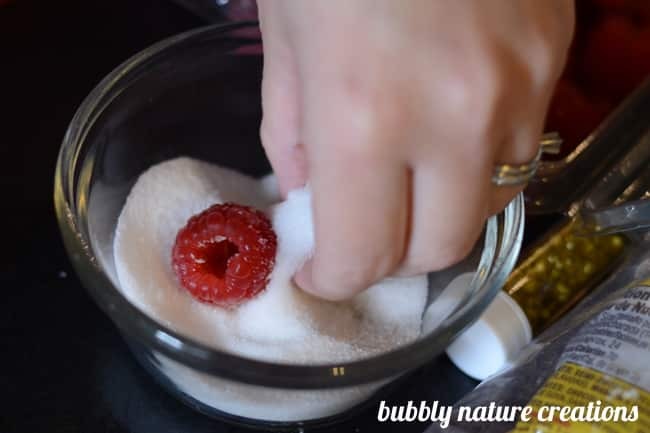 Do the same for the mint leaves if you are using them, but only apply the egg beaters and sugar to one side. Set the berries and mint leaves on a paper towel to dry (about 10 minutes). 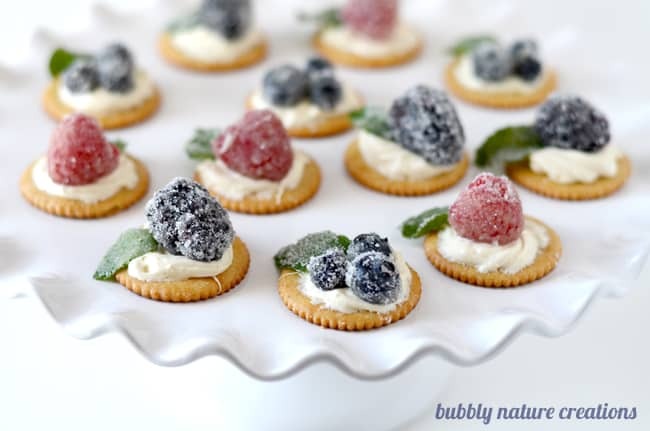 Assemble crackers with a layer of the cream cheese either by spreading it on with a knife or piping it on with a tip. 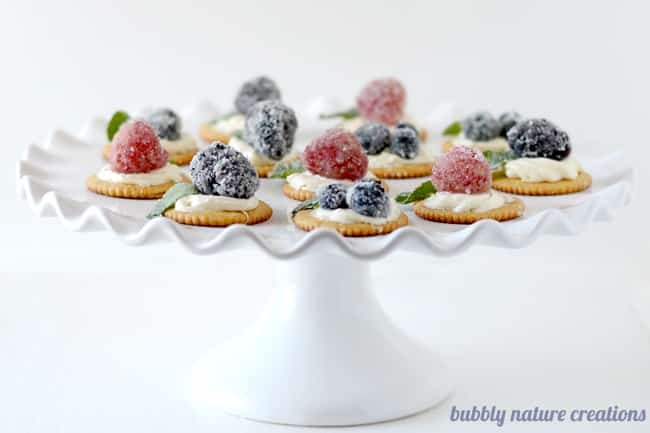 Once the berries and mint leaves are somewhat dry (they might be a little sticky) lay them on top of the cream cheese. 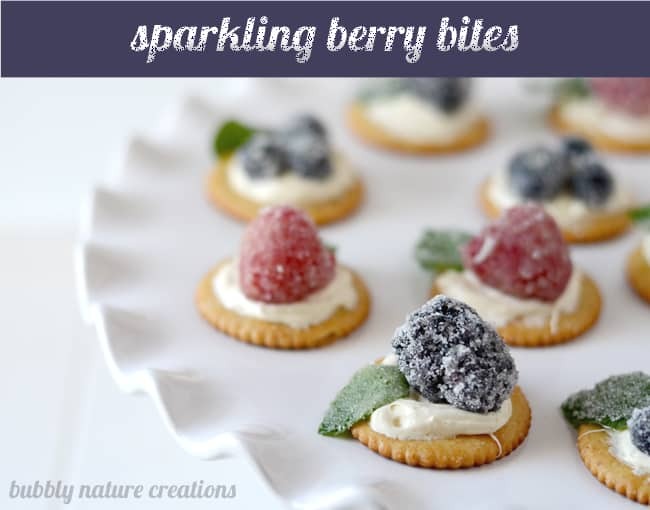 You should be able to fit one to three berries on each cracker. love the sparkly touch! i notice a new banner. nice! happy new year! Thanks, Maria! Hope you have a great New Years celebration!